Maldivians have been surfing using planks for a long time. However, modern surfing came to the Maldives in the late 70s. In 1973 Tony Hinde an Australian surfer took a break from surfing in Sri Lanka and together with a friend set sail for the Africa. He was never to reach his destination. 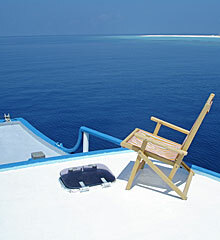 His ship seriously off course was shipwrecked on the shore breaks of Male'. Tony discovered the thrill of surfing on the Maldivian reefs. He changed his name to Tony Hussein Hinde, married a local lady, opened his own surf agency and decided to stay for good. The recent O’Neil Deep Blue Contests held in the Maldives has placed Maldives firmly on the world’s surf map. While most of the recognized surf breaks are in Male’ Atoll, there is certainly more to be discovered. Some resorts provide boats (Dhonis) to transport surfers out beyond the breaks up to three times per day for two hour periods whereas charters offer surfers the chance to surf the reefs for longer periods. To learn more about surfing visit our exclusive surf travel website 'Surf Maldives'.